It occurs to me that when I was a little girl, listening to fairy tales I was not that interested in the central heroine. The appeal of being Cinderella or Sleeping Beauty passed me by. The far more interesting character seemed to be the Fairy Godmother. She wasn’t waiting for something to happen to her. She made things happen. She was the fixer. Quite frankly she had all the fun. So I wonder if this has been my life-long ambition. Rock up somewhere unannounced, sprinkle a little star dust, a little bit of whimsy and then disappear again almost as quickly. I think I am probably living this small girlhood plan through my yarny exploits. Let’s start at the beginning. A couple of weeks ago I got my hands on a new yarn by Designer Yarns; Apollo. It comes as a satisfyingly large ball of 300g. The colour choice I had was Aurora, which is really a rainbow of colours from fuchsia pink, through to golds and aqua marine. Now I don’t normally veer towards variegated yarns or blended tones in my design work. But I was attracted to the soft and silky texture and I was intrigued to see how the tonal repeat would work. The yarn was so soft that I thought, ‘this would make an excellent baby blanket’. 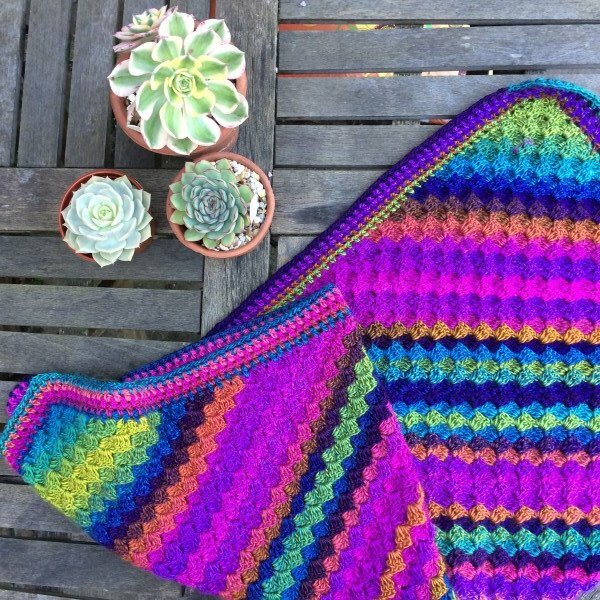 The unusual colour combination nearly put me off, but then I remembered that some good friends are expecting their third child and this more adventurous approach to the traditional buggie blanket might serve them very well. Let’s face it, the third baby very rarely get anything new or bespoke. I had plenty of projects already on the hook and wanted a little simple project. I began a standard corner-to-corner square. As the colour changed, I became more enchanted by the results. 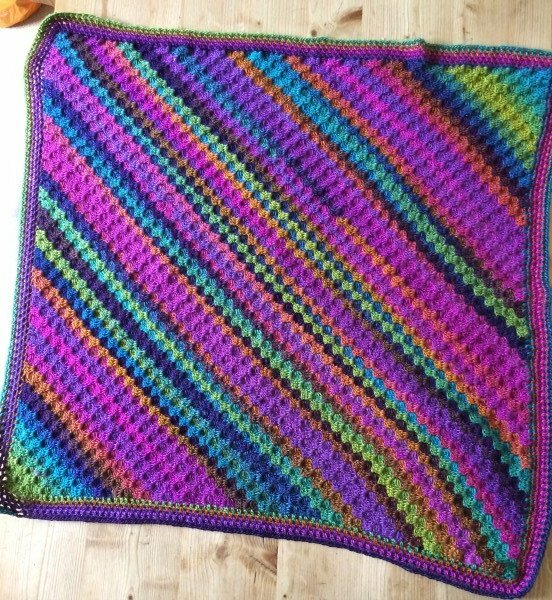 If you are interested, the blanket is approximately 101cm (40in) square and I used about 450g of yarn, which equates to 1 and half balls of yarn. 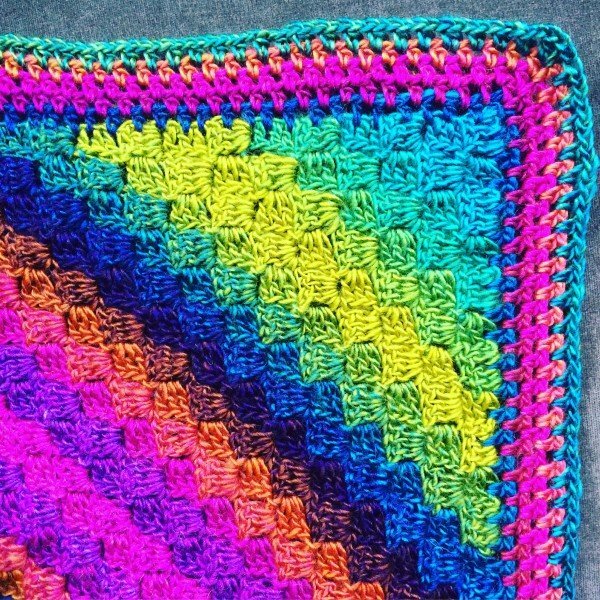 When I had completed the main square of the blanket I then edged the work with a linen stitch border. I do not mind telling you that I am overly pleased with the finished project. It is so soft and the tones are so imperceptibly blended. 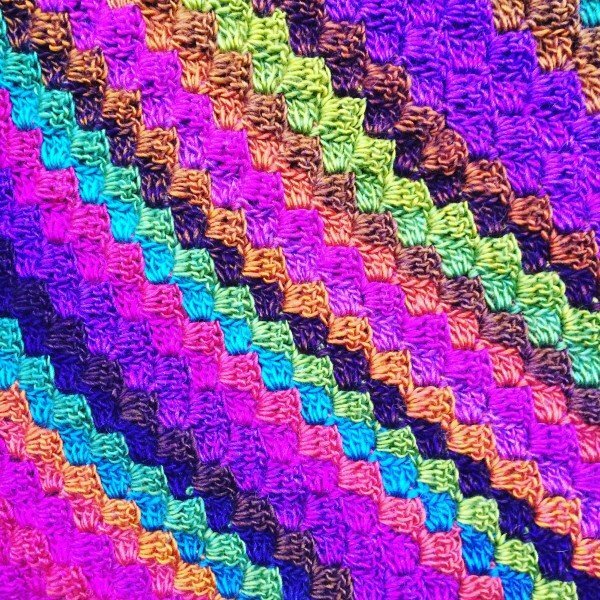 I showed the finished blanket to some colleagues at work and they couldn’t seem to find where one colour started and another ended. So there you go, one rather different baby blanket. 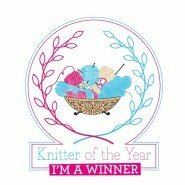 But I had some yarn left over….what to do, what to do? 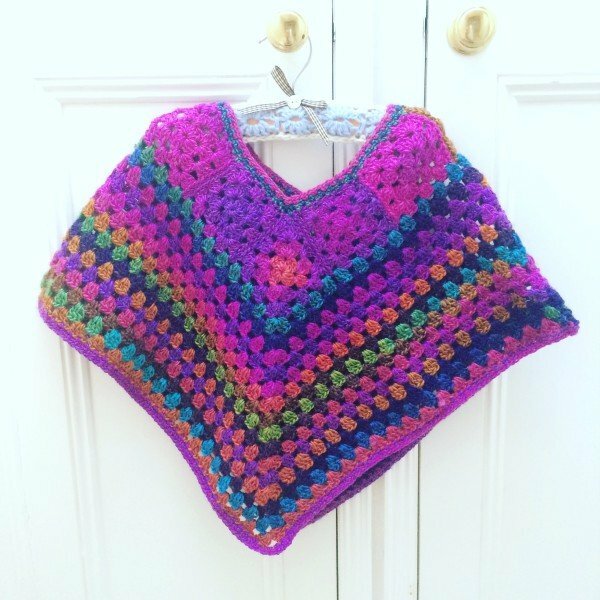 Luckily I had spotted an excellent pattern for a child’s poncho in Colourful Crochet by the fabulous Marianne Dekkers-Roos. This is an excellent book, and I highly recommend it. So as quickly as I could, whipped up sweet poncho for my friend Betsy. Betsy is the most scrumptious little girl. She is the champion big sister of Rufus and will be an equally stunning big sister to the owner of the colourful baby blanket. 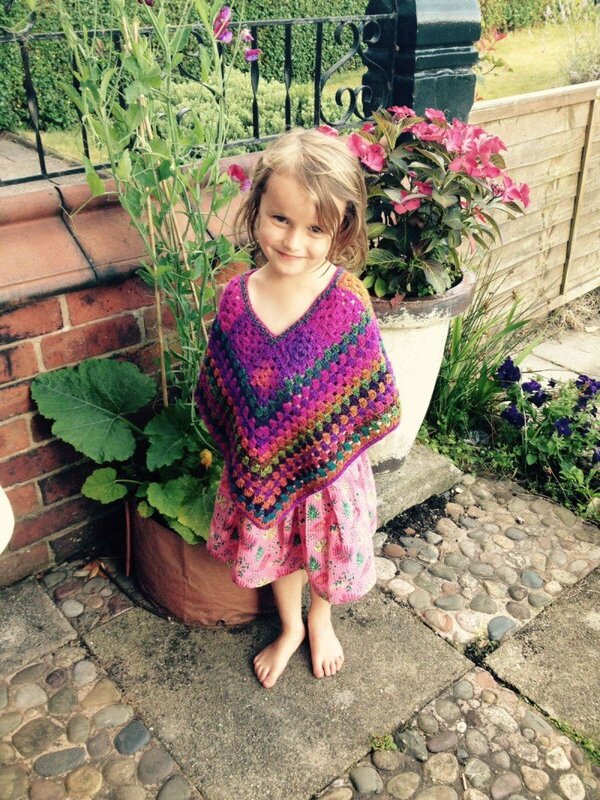 I was too excited to wait until the baby arrived and if I am honest I would have paid serious money to see the delight and utter surprise on Betsy’s face when I arrived unannounced at her door, laden with her Aurora Poncho. Frankly this is a close as you can get to be a woolly Fairy Godmother and I’m living the fairytale dream. 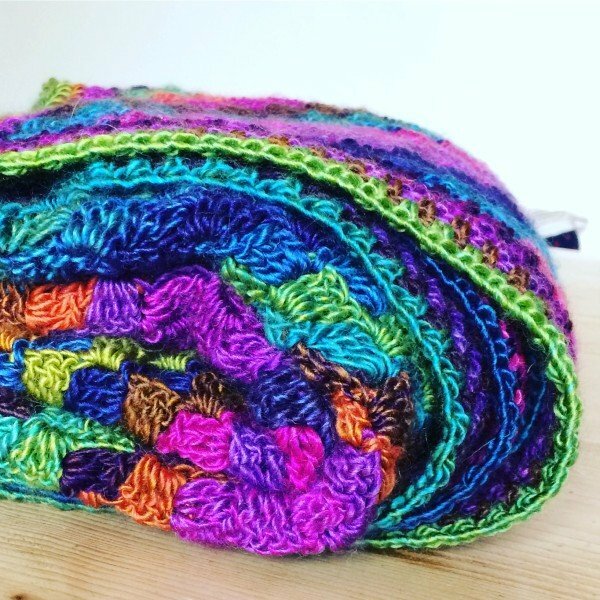 Designer Yarn Choice – Apollo will be in the shops Autumn 2017. There are lots of different shades for your to try.